That's not a baton Chris Etheridge is twirling! It's an 80 ft. (24.4 m) length of steel pipe, weighing in at 20,000 lb. (9,072 kg) which he's spinning deftly into place to load onto a waiting truck. Etheridge is plying his trade, operating a new purpose-built SENNEBOGEN 870 M pipe-handler, in the Berg Spiral Pipe storage yard in Mobile, AL. The mill here produces up to 220,000 tons per year. Etheridge's job, as part of the Berg logistics team, is to get it all loaded and on the way out to America's oil and gas projects quickly and, above all, safely. Berg Spiral Pipe selected the SENNEBOGEN 870 M for its combination of heavy lift capacity and long reach for stacking and loading steel pipe. The mill's Planning & Logistics Manager, Bob Ward, is confident in Etheridge and his equipment. “Our company has a lot of good experience with SENNEBOGEN machines at our facility in Mobile, AL, our sister operations in Panama City, FL and our home base in Germany. We have a smaller machine, a SENNEBOGEN 850, operating here since 2010. But for handling our larger pipe, up to 48" (1,219 mm) diameter, we needed a machine with more capacity." The 870 M has now logged more than 4,500 hours in the Berg yard. Ward has deployed a fleet of loaders to transport and stage the rows of pipe in the yard. Etheridge and his 870 stack the pipe for storage, and also load shipments onto trucks for delivery. "It's a very versatile machine," Ward notes. "We have 50 acres of storage here. With its wheeled undercarriage, the 870 has good speed for moving through the yard and picking the pipe sizes we ship"
The operator is seated in a hydraulically elevating cab that can rise more than 20 ft. (6.1 m) to offer a clear view of the stack, the truck it’s loading and ground support personnel. Fitted to the boom is a heavy-lift vacuum system, powered electrically from the 870's on-board generator. Upsizing from an 850 to an 870 machine gives Ward a much-needed capability in the yard. "Chris has to pick up the pipe from the end, not from the center” says Brian Kinsey, Shipping Supervisor. “To balance the load, he has to reach 40 ft. (12.2 m) into the stack, where the vacuum lifter can grab the middle of the pipe. We needed the 870 to be able to lift that much weight, at that long reach." According to Etheridge, the 870 helps him keep loading and stacking operations safely as well as efficiently. "The hydraulics on this unit are very smooth, so it's safer and more precise while it's lifting, turning and swinging the pipe.” Accurate placement of the vacuum attachment is essential to ensure a sure grip that will hold throughout the loading cycle. 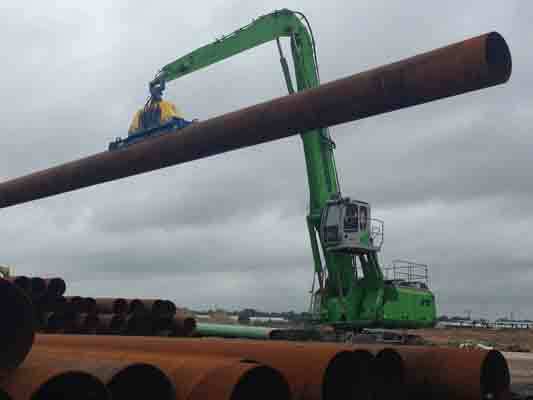 With the power and accuracy of the 870, Etheridge will complete a four-piece load of large diameter pipe, plus the wooden stays that stabilize it on the truck deck, in as little as six or seven minutes. Etheridge also appreciates SENNEBOGEN's elevating cab. "You can raise or lower the cab to just the right height for the different layers of pipe," he says. Precision and gentle handling are especially important to protect the coatings on the pipe which will preserve it from environmental factors after it's buried. Along with the standard rear-view camera, the 870 is also equipped with a side view camera - standard on SENNEBOGEN machines - that further enhance the operator's view of his work area. Etheridge often works long shifts, up to 12 hours, to keep pace with shipping schedules, so he's thankful for the cab's ergonomic design and climate controls. Combining reach, load capacity, mobility and smooth handling, the 870 M has delivered the capability that Ward was looking for. After two years of operation, the 870 has shown it can do the job reliably, too. "Its design allows for good hydraulic flow and speed," he says, "so you can open the full hydraulic load without killing the engine. Mechanically, the only part we've had to replace is the horn! Our dealer, Tractor & Equipment Company takes care of all of its servicing and they've been very good to work with - very responsive to our needs and our scheduling."